This presentation is about the Roman Catholic rituals that take place every year in the Philippine province of Pampanga. During Holy Week, hundreds of men undergo acts of self-inflicted pain in ways that commemorate the Passion: the torment and crucifixion that Christ endured in the last days of his earthly existence. The discussion will focus on three interconnected ritual acts: the pabasa, a days-long communal chanting of Christ’s Passion story; the magdarame, the public self-flagellation of hundreds of devotees, and the pamamaku king krus, in which steel nails are driven through the palms and feet of ritual practitioners as part of a street play performed in front of tens of thousands of spectators. At the core of these rituals are what I describe as painful intercessions: the attempt to ritually embody pain as a way of appealing for Christ’s divine intervention into the lives of the faithfully devoted. What physical, sentimental and devotional conditions enable ritual actors to go through extreme pain in pursuit of painful intercessions? What justifications are given in going against official prohibitions against the practice? What outcomes, material or otherwise, do ritual protagonists seek in channeling Christian piety in this gruesome way? In addressing these questions, I draw upon ethnographic data from close engagement with a host of local stakeholders — including ritual practitioners, clerics, scholars and government officials. 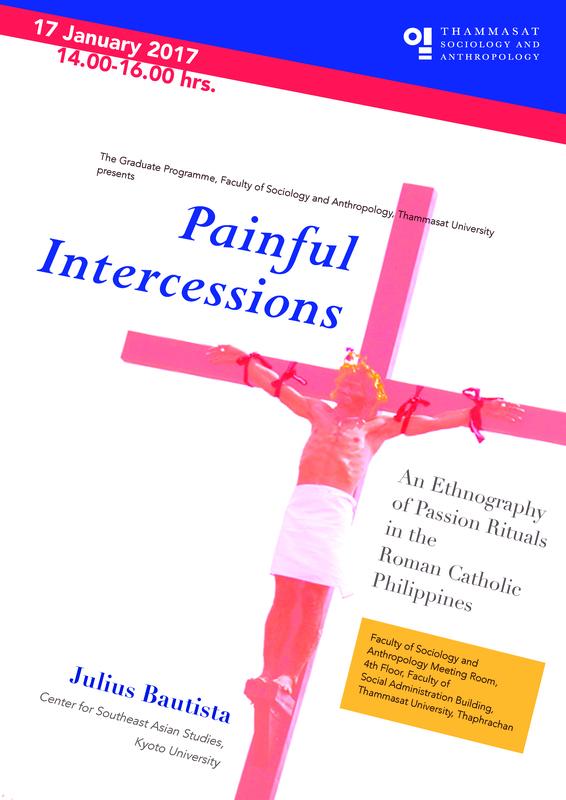 I will discuss the notion that painful rituals are not expressions of an aberrant theology or a stylized performance-aesthetic, but are expressions of heartfelt sentiments of intersubjectivity, such as pity, empathy, trust and bereavement. By emphasizing these very relatable human sensibilities as the wellsprings of ritual agency, I demonstrate that Passion rituals are reinterpretations of the very idea and experience of pain, hardship and sacrifice. Julius Bautista is Associate Professor at the Center for Southeast Asian Studies, Kyoto University, Japan. He is also an associate of the “Religion and Globalisation in Asian Contexts” cluster of the Asia Research Institute at the National University of Singapore. He received his PhD in Southeast Asian Studies (in anthropology and cultural history) at the Australian National University, and has subsequently published on religious practice in Asia, with a focus on Christian iconography, religious piety, and the relationship between religion and the state. He is author of Figuring Catholicism: An Ethnohistory of the Santo Niño de Cebu (Ateneo, 2010), editor of The Spirit of Things: Materiality and Religious Diversity in Southeast Asia (Cornell SEAP, 2012) and co-editor (with Francis Lim) of Christianity and the State in Asia: Complicity and Conflict (Routledge, 2009).